KANSAS CITY, Mo. –Following an upset of then-No. 12 Barry, along with a sound 19-point win at Embry-Riddle, Nova Southeastern has jumped all the way to No. 9 in this week’s National Association of Basketball Coaches (NABC) poll, released Tuesday afternoon. Slotted at No. 17 a week ago, the Sharks continue to impress during the early stages of the season after opening Sunshine State Conference play with a pair of notable victories. Leading scorers David Dennis and Mark Matthews combined for 50 points, while Nova Southeastern closed the final 2:28 on a 14-4 run to beat the Buccaneers, securing the program’s highest profile win under head coach Jim Crutchfield. 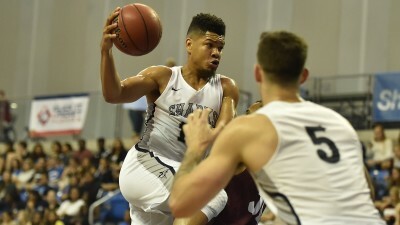 There was no ensuing setback on Saturday either, as the Sharks shot a blistering 60 percent from the field in their road debut en route to a decisive 106-87 win over Embry-Riddle. The 100-plus point performance was already the fourth this season for the nation’s top scoring offense (108.4 ppg). Nova Southeastern takes over as the highest ranked team in the SSC, followed by No. 15 Florida Southern and No. 16 Barry. No. 1 Bellarmine received all 16 first-place votes for the third consecutive week, as the Top-5 remained unchanged. Nova Southeastern will look to build on its 5-0 start when it travels to face Saint Leo this Saturday at 7:30 p.m. For complete coverage of the action, follow the Sharks on Twitter @NSU_MBasketball or visit the schedule page on NSUSharks.com.